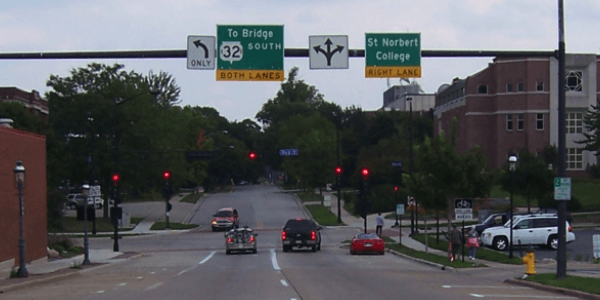 DePere Traffic Signal Analysis - TADI - Traffic Analysis & Design, INC. DePere Traffic Signal Analysis - TADI - Traffic Analysis & Design, INC.
TADI was retained by the City of De Pere to retime and optimize for progression 13 intersections along 3 corridors within the City of De Pere. TADI conducted before/after analysis of the study intersections; prepared revised/optimized traffic signal timings; oversaw field implementation of the timings; calibrated and fine-tuned the timings in the field, identified future projects for the City to consider to accommodate 20-year projected traffic; identified mitigation measures for anticipated USH 41 construction detoured traffic; and prepared a full traffic signal timing impact report. Improvements realized from the retiming project include delay decreases of 15- to 66-percent and decreases in stopped vehicles of 6- to 44-percent on the given corridors.